Ht: 5’10” Wt: 168 lbs. For the second consecutive season, the top prospect in the NHL Entry Draft should go wire-to-wire as the consensus No. 1 draft pick. In 2018, it was Rasmus Dahlin. In 2019, however, it’s Jack Hughes. While there are other talented players in the top-end of the draft who will make teams very happy, Jack Hughes is simply in a world of his own and it’s a fact that’s been known for quite some time. Hughes was already being discussed prior to the 2018 Draft as the 2019 Draft’s top prize. Even more impressive is the fact that he was 16 years old at the time. Hughes has been a dominant player in the USHL since joining the Under-17 and Under-18 teams a season ago. With the U-17 team, he’d score three goals and 15 points in just nine games. He’d do even better with the U-18 team when he scored 18 goals and 39 points in just 18 games. 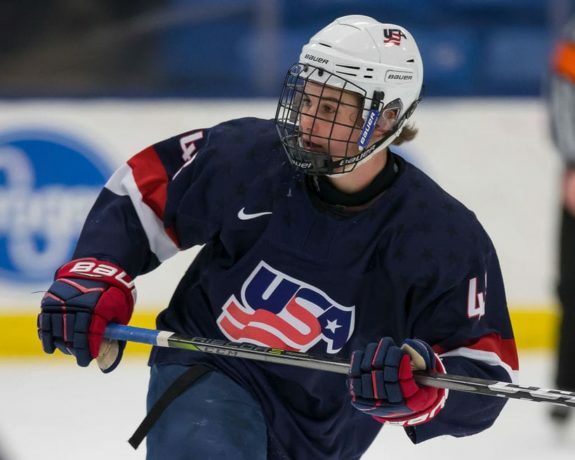 This season with the U.S. National Development Team, Hughes has done nothing to hurt his draft stock and has only reinforced the fact that he should be the first player taken off the board in June. While the stats alone are impressive at 12 goals and 43 points in 22 games, anybody who’s watched Hughes play knows that he’s so much more than numbers on a stat sheet. It isn’t hyperbole to say that Hughes makes multiple highlight reel-worthy plays every single game he plays. He’s an excellent skater with the smarts and maturity to make an impact in the NHL from day one. While size may be a concern for some, it really shouldn’t be worrisome in today’s NHL with some of the best players in the league coming in at a similar stature. Being fast is one thing. Being able to play at such a high speed is another thing entirely. Hughes has the skating ability, shot, vision, play-making prowess and smarts to excel at such high speeds akin to NHL superstars like Connor McDavid and Patrick Kane. Hughes will almost certainly be the No. 1 overall selection in the 2019 NHL Entry Draft. 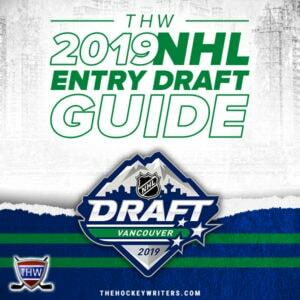 Barring a team falling in love with another prospect more than Hughes, whoever wins the draft lottery should start planning for the 2019-20 season as if Hughes will be in their lineup. Hughes projects to be a legitimate No. 1 center at the NHL level and could immediately slot into a top-six role from his first day with a team next season. He has the potential to not only be the best player on his team but also one of the top-five players in the entire NHL. Hughes would win the Dave Tyler Junior Player of the Year Award as the best American-born player in junior hockey following the 2017-18 season. He’d break the all-time points record for the NTDP in 2018-19, a record previously held by Arizona Coyotes’ forward Clayton Keller.